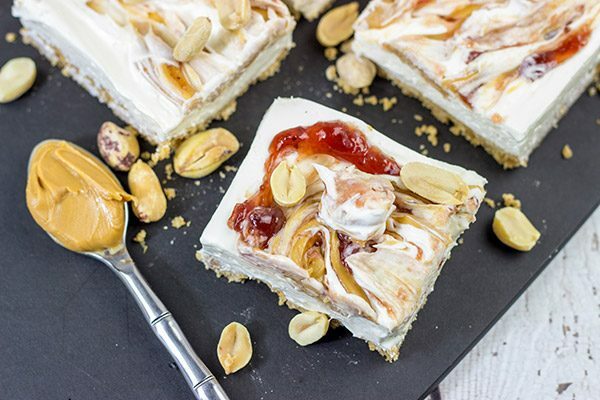 PB&J Cheesecake Bars - It's Peanut Butter Jelly Time! April 2 is National PB&J Day. Yes, peanut butter and jelly has it’s own day. I love reading about food, I love writing about food, and of course I love eating food. But I just don’t go crazy about national food holidays. There are so many food holidays! Pork Rind Appreciation Day? Yup, it’s February 4. National “Eat What You Want” Day. Uh, what? It’s May 11. 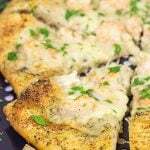 National Pizza With the Works Except Anchovies. Why not? That’s November 12. But PB&J Day? I can get behind that one! It’s peanut butter jelly time! Whenever I hear PB&J, I can’t help but think about that silly downright stupid “It’s Peanut Butter Jelly Time” meme that took the internet by storm circa 2001. I’ve included the YouTube video below, but you’ve been warned. The song is just as bad today as it was back in the early 2000’s. I just watched about 5 seconds of the video myself, and that was 5 seconds too much. On a somewhat related topic, what in the world does a dancing banana have to do with peanut butter and jelly? Terrible viral internet songs aside, let’s talk about peanut butter & jelly. As I’ve noted on a number of occasions, I actually don’t like peanut butter & jelly sandwiches. I’m typically not a fan of sweet flavors in savory foods, so I opt for my peanut butter & jelly sandwiches sans the jelly. I’ll gobble down a peanut butter sammich, but I hold the jelly back for toast. 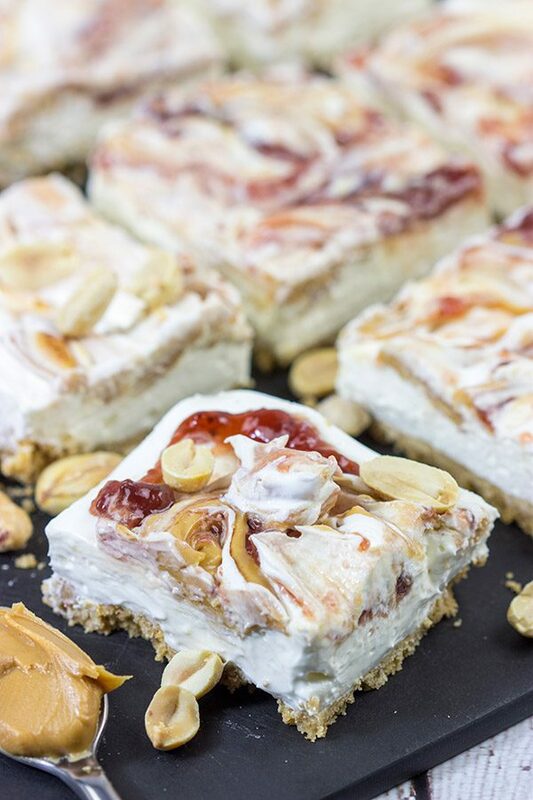 However, with that said, I’ll do the salty + sweet combo when it comes to desserts…and these PB&J Cheesecake Bars are an excellent salty + sweet dessert. 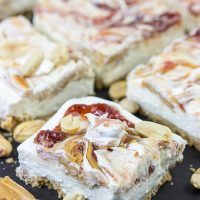 For these PB&J Cheesecake Bars, I went back to these No Bake Peanut Butter Cheesecake Bars from a couple of years ago. Add in a couple swirls of jelly, and *boom* you’ve got PB&J Bars. To be fair, I used some strawberry preserves for these bars because that’s what we had in the fridge. PB&P bars just don’t have the same ring, though. These PB&J Cheesecake Bars are a piece of cake (err, cheesecake) to make, too. Just combine softened cream cheese with powdered sugar and a small container of whipped topping. Pour that mixture over a graham cracker crust and then swirl in some peanut butter and jelly. Off to the freezer for a couple of hours, and that’s it. You’ve got PB&J Cheesecake Bars…perfect for celebrating National PB&J Day! Did you make a batch of these PB&J Cheesecake Bars at home? Leave a comment! Or snap a photo and tag me on Instagram (@Spicedblog). Cheers, friends! 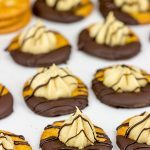 Looking for more peanut butter desserts? I’ve got ya covered! Using a small food processor or mini chopper, add graham crackers and pulse until finely ground. Transfer crumbs into a large bowl. Add brown sugar and melted butter; stir until well combined. Layer an 8”x8” baking pan with parchment paper. Press crust mixture into bottom of pan using a flat-bottomed glass. Bake for 10 minutes. Let crust cool fully before adding cheesecake mixture. Spread the cheesecake filling evenly on top of the crust. Using a small glass bowl, melt the peanut butter in the microwave. (Note: The goal is to make the peanut butter fully smooth without “cooking” it.) Set peanut butter aside. Using a separate glass bowl, melt the jam in the microwave. Again, the goal is to just make the jam smooth enough to swirl without “cooking” it. Drop several spoonfuls of melted peanut butter and melted jam on top of the cheesecake layer. Using a knife, swirl the peanut butter and jam into the cheesecake. There really is a food holiday for everything, isn’t there? But these? David, you’ve really hit it outta the part…I mean, pb & j AND cheesecake? Totally dreamy, creamy deliciousness right there. These would be dangerous to have around 😉 Pinned. P.S. Thanks for that peanut butter jelly song….that’ll be in my head ALL.DAY.LONG lol. Have a great weekend ahead! I’m with ya, Dawn! I think you could name a food (any food! ), and you could probably find a food holiday celebrating it. The fun thing about these PB&J cheesecake bars is you can celebrate them on PB&J Day (April 2) AND on Cheesecake Day (July 30). Talk about a win-win! Also, my apologies for the peanut butter jelly song. Haha. PB & J? Can’t say I was ever a fan…in fact, like you, I love peanut butter in a sandwich (or straight out of the jar), and I’ll eat jelly ( strawberry preserves) on toast, but do not combine them. I will not eat a PB & J sandwich. Now these bars? 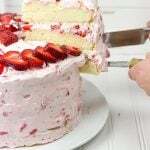 I may have to make them because they have cream cheese and whipped topping. As I said, MAY make them. It will be a walk on the wild side. Stay tuned! Yes! Someone else who shares my same thoughts about PB&J. PB on the sandwich. J on the buttered toast. That’s it! Except when you combine the two flavors in a dessert, it totally becomes ok. (And that’s coming from someone who never eats a PB&J sandwich!) The sweet + salty combo is quite tasty in dessert form. Thanks, Terri! Well, I didn’t know this day existed, and I feel like I have been missing out all these years now! 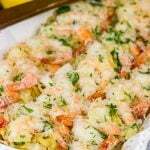 🙂 I will try and make these tomorrow – they look divine! There’s a National Peanut Butter and Jelly Day? Wow! I managed 25 seconds of that video before I had to turn it off. But then again I can’t remember having seen it before. It probably would have been much less otherwise. Ha ha! Anyway Love these PB&J Cheesecake bars. So creamy! Have a great weekend! 25 seconds? That has to be an all-time record for that video, Neil! I’m going to assume your mouse broke, and you couldn’t find the plug for your computer. Personally, I can’t handle more than about 2 seconds of that one! 🙂 Either way, these bars are tasty, and they might help you forget about that terrible song. Might. Cheers, my friend! Yum, David! 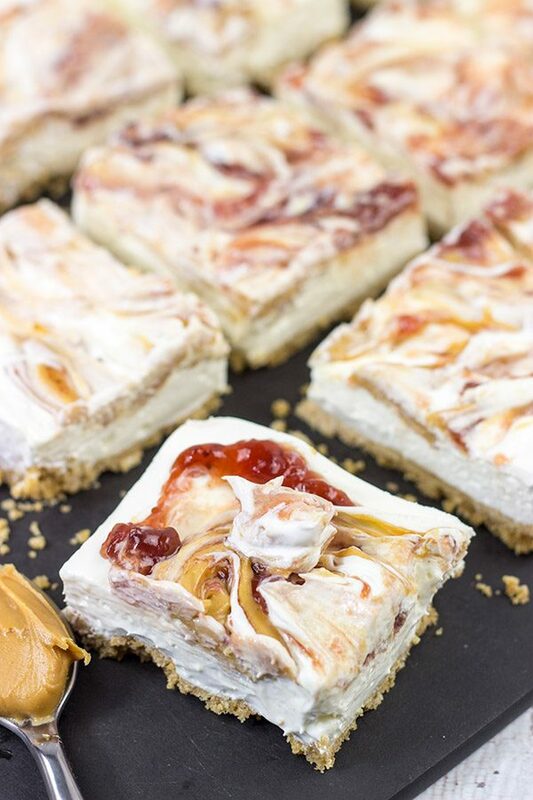 Your PB&J Cheesecake Bars look fantastic. I’m with you when it comes to PB&J sandwiches. Likely too many in my school lunches growing up. But I’ll take some of your PB&J Cheesecake Bars anytime. Thanks for sharing. Yup, it was the school lunches here, too, Ron. To be fair, I never loved the flavor combo in sandwich form, but then when I’d take the sandwiches to lunch, the jelly would make the bread turn all mushy. No thanks! But in cheesecake bar form? I’ll take these any day! OMG I’d totally forgotten about that video! It must’ve been the first thing to really go viral online right? And it was also probably the worst. 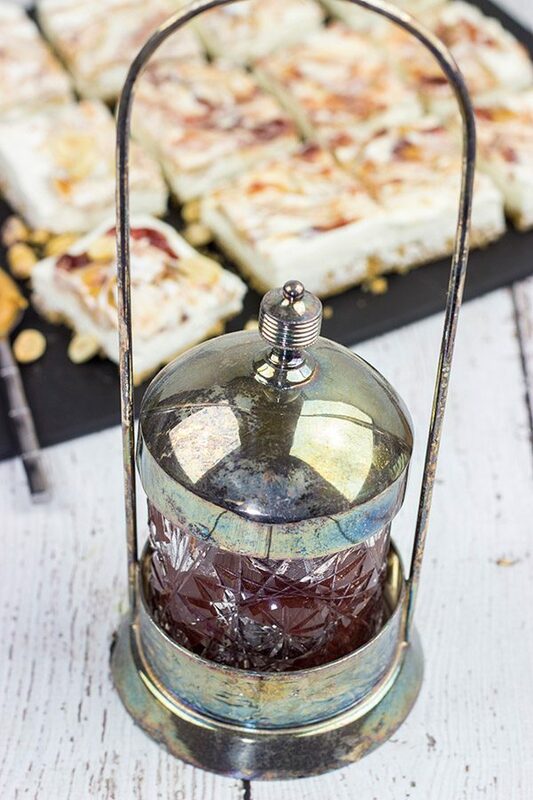 I can definitely get behind these cheesecake bars though–no surprise there :). The only way to improve on cheesecake is to add some pb! In other news, I saw that a team from the Coyote Curling Club down in your area won the National Curling Club Championships. That’s a legit honor. You should make your way over to that club! Just sayin’. I had no idea that April 2nd was national peanut butter and jelly day and boy do you know how to make a PB&J dessert look irresistible!! Haha! There really is a food day for everything. I don’t care what day it is…I’ll gladly take one of these PB&J desserts any day of the year! 🙂 Thanks, Marissa! Well how doesn’t love a good PB&J!? Rhetorical question, of course. I would happily celebrate these two combined ingredients any day. 🙂 Add a little cheesecake to the mix, and oh my! Awesome pics, too! Hope you’re have a delicious weekend, David. Thanks so much, Valentina! I’m a huge fan of sweet + salty desserts, so PB&J works perfectly for that combo. 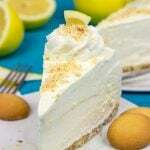 A no-bake cheesecake is the perfect base for this one, too. Thanks so much, my friend! I’m with you on PB&J. I love peanut butter and I like marmelade, but the combination doesn’t float my boat. And it didn’t when I was a kid, either. But I have to say, these cheesecake bars do look pretty. And the serveware is beautiful! I have a few pieces from my grandmother’s kitchen for serving fruits and nuts, even an old-timely tabletop toaster, and they’re very precious to me. I’m glad to know I’m not the only one, Frank! It seems like there are a few of us out here that don’t like PB&J in sandwich form. But in dessert form? Delicious! Now I’m intrigued about that tabletop toaster. You should share that in a post sometime! I bet it has a great story behind it. WOW! 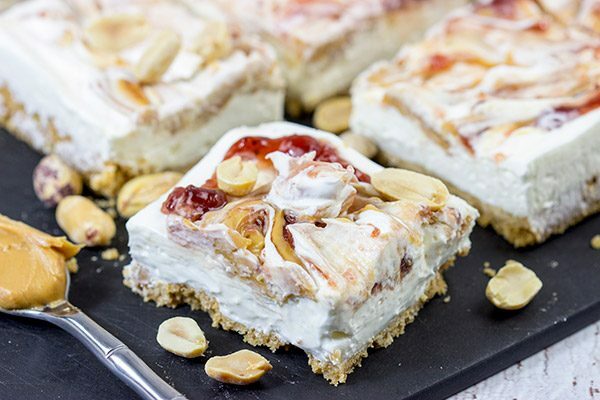 This cheesecake bars looks delicious! Can’t wait to try it. Thanks so much, Rose Mary! I love a good cheesecake, and the PB&J flavor combo here is quite tasty for sure. Thanks for the comment! I’ll bet there’s a national day for something every single day! This is one day I’d have a tough time getting behind – I’m just not a fan of peanut butter! I do make PB&J sandwiches for my kids and I also make the occasional peanut butter treat for them. They’d be huge fans of these cheesecake bars! Ok, David! This is on my Must-Make list! 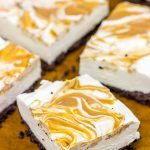 I’m crazy for peanut butter, and a no-bake cheesecake? I may have to just bust out the graham crackers right away, you know, since I missed the holiday. Gotta catch up sometime, though! Thanks and pinning! I so remember “It’s Peanut Butter and Jelly time”! Haha – now I have that twirling around in my brain…am hoping I don’t dream about that – but I’d LOVE to dream about PB&J -especially in cheesecake form! I was introduced to PB&J after lil S was born – and I have loved the combo in every form – but I haven’t ever had a PB&J cheesecake! Fantastic job with these, David! Oh man, that song is downright terrible, isn’t it? I can’t take more than about 2 seconds of it before I have to race to turn it off! Let’s leave the song off and just eat PB & J Cheesecake Bars instead, ok? 🙂 Happy Tuesday, my friend! I totally agree, Nicole! Laura and I sat there trying to guess what it was for the longest time. I finally had to call my Grandmother to see what in the heck it was. Kinda cool, huh? Hope you’re doing well, my (sorta neighbor) friend! David, I didn’t want to click the video, but I couldn’t resist! What a (an unfortunate) blast from the past. I love peanut butter and jelly sandwiches. They’re a lot better than the cheez whiz and jelly sandwiches I had to eat because my mother thought it was more of a balanced meal. (I really hope that wasn’t a thing for other kids back then.) At least peanut butter and jelly are both kind of in the dessert category. Relatively speaking. These PBJ cheesecake bars look so delicious! Definitely the creamiest, yummiest way to have peanut butter and jelly! Haha! An unfortunate blast from the past is exactly the right description for that video. Nothing on the internet is truly ever gone, right? Uh, hold up. Cheez whiz and jelly sandwiches? Oh my. 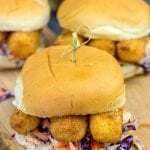 Do you ever have a craving to go back to this sandwich? It sounds like a, uh, unique combination of flavors!